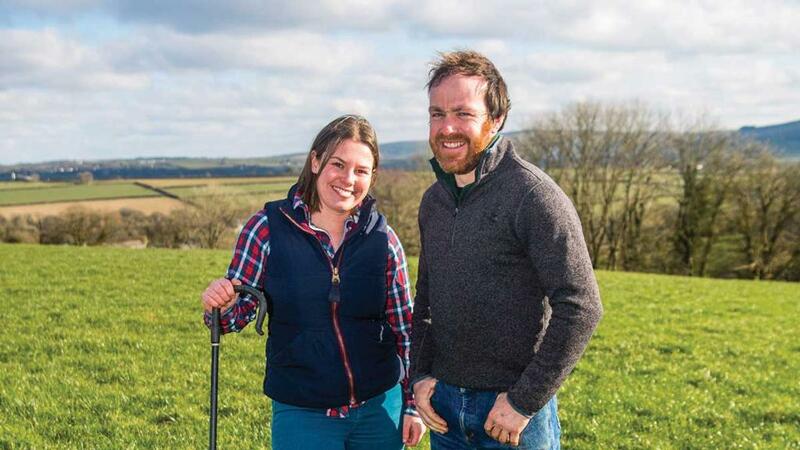 A willingness to implement change and a Nuffield Farming Scholarship has overhauled Gorwel Farm, run by partners Deian Evans and Jamie McCoy. It’s just gone six years since Deian Evans and Jamie McCoy arrived at Gorwel Farm – and they have made big changes in that time. Since taking over running the family farm in Ceredigion from Deian’s father and uncle in 2011, the couple have invested in a new milking parlour, new cow housing, machinery, slurry facilities, tracks and troughs. They have implemented a paddock grazing system and switched from year-round to block calving. All this, along with increasing the amount of land they rent, trebling the size of Gorwel’s dairy herd and almost quadrupling the number of sheep they graze, means the farm has seen a significant transformation. The home farm at Gorwel, which is owned by the family, operates across 36 hectares (90 acres). Deian and Jamie rent an additional 48ha (120 acres) for winter fodder thanks to various agreements with local landowners. They also rent more than 40ha (100 acres) of other ground for grazing sheep and youngstock. The original herd was a Freisian-Holstein base, but in recent years the couple have started cross breeding to achieve a more robust cow in their 180-head herd. Deian says: “We want a cow which will graze well, but autumn calving means each cow needs to have the capacity to eat enough silage when they are at peak production and housed. The Fleckvieh, a central European breed originated by cross-breeding local stock with Simmentals from Switzerland, is suitable for both milk and meat production. “It’s not that common in the UK, but it’s a really good dual-purpose breed,” Jamie explains. “It’s one of the most common dual purpose breeds in the world, with an estimated worldwide population of 41 million animals. “Changing systems is always difficult and it’s taken longer than we expected to get to a block calving system,” she adds. While the cows are summer grazed, the forage is all home-grown grass silage, grown on the rented ground. They are fed around 1.5 tonnes of concentrate per year in the parlour, with the majority of milk produced from forage. With milk sold to Glanbia, yield targets are around 7,000 litres per cow per annum. “We have a solids milk contract,” says Jamie, who also works for ADHB Dairy in South Wales as their knowledge exchange manager, organising events for dairy farmers. “We wanted to maintain the milk quality, but also to add value to our beef calves. The cattle are grazed in summer for as long as possible. The couple’s sheep are all commercials with a Texel base, producing lambs for fat lamb market. Lambing starts on March 1 and takes place indoors and outdoors, driven entirely by the amount shed space available. The lambs are all finished on grass and sold either finished to Dunbia or through the local livestock market at around 18-21 kilos. While they have increased the operation at Gorwel’s size, for Jamie and Deian it is not simply about numbers, or even profitability. It is also about community. In 2013 Jamie was awarded a Nuffield Farming Scholarship and is keen to introduce some of the recommendations she identified through her research topic of what the next steps are for the small family farm. She says: “My Nuffield Farming Scholarship focused not only around identifying opportunities for growth for small farms, but also on looking at whether expansion is always the right option. “So many farmers are driven simply by numbers – of livestock or acres – but bigger doesn’t always mean more profitable. Jamie’s experience of the agricultural community, both at home and during her travels in numerous countries including New Zealand, Canada and the USA, informed not only the couple’s farming practice, but also their attitude. “If we want rural communities to thrive we have to make that happen ourselves,” she says. “I want to play an active part in our local community,” she says. “I’ve experienced a lot of generosity as I entered the industry, but it started long before that. My parents were sheep farmers in Norfolk and when I was a child my dad used to buy breeding ewes in, and one farmer used to put an extra sheep on the lorry for me. “When you’re nine or 10 years old, getting the money from selling the lambs from your one or two sheep is a big thing. Funnily enough, my lambs always seemed to make the highest price, but I suppose we didn’t have EID back then! With this in mind the couple, who met while studying agriculture at Aberystwyth University, have hosted Open Farm Sunday events at Gorwel for the last two years, attracting more than 100 people on both occasions. “It’s really important to show how food is produced and what happens on a farm,” she explains. “It’s a great day. It’s a lot of work, but a good excuse to have a tidy up and take pride in what we do here. “Unfortunately our village doesn’t have a park or a pub, so there’s no natural place for people to convene. Visitors were able to pet a lamb or pig, sit in a tractor, look at static machinery displays, visit the milking parlour and watch a milking demonstration. There was also a nature table with binoculars, along with self-guided farm tours, information boards and even animal skulls and fleeces to touch and feel. Jamie was unsure whether the public would be interested in learning more about their farming, but was proved wrong when they opened their farm gate for the first time in 2016. “We live in rural west Wales and my perception was ‘surely everyone has a connection with agriculture and everybody knows what goes on at farms, so why would they want to visit one?’ But I was wrong. “It gives visitors an association between what happens on a farm and what’s on the supermarket shelves. They get an understanding of what’s going on inside the farm buildings. They get a flavour of what we do. The pair are keen to encourage other farmers to get involved in the 2018 event and Jamie is already on with planning. “Other farmers might have questions or concerns about taking part,” she says. Looking back to their overall farm business, the couple’s drive to improve quality and make the farm more profitable continues. “One of the biggest changes we’ve made here so far has been changing from AYR to block calving,” Jamie says. “But there’s plenty we can improve on in terms of technical performance.